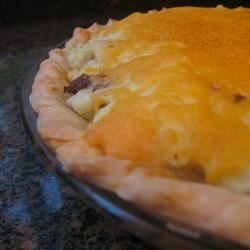 "Great way to have the favorite meal of meat loaf and mashed potatoes in one. This is great for the kids. Serve with green beans." In a skillet over medium heat, cook and stir the ground beef and onion until beef is evenly brown. Drain, and allow to cool slightly. In a bowl, mix the cooked beef and onion, egg, ketchup, and Worcestershire sauce. Spread the corn in the bottom of the pie crust. Layer with the beef mixture. Spoon the mashed potatoes over the beef, and top with cheese. Bake 30 minutes in the preheated oven, until cheese is bubbly and lightly browned. I also didn't use the pie crust, which reduces the fat a lot. Delicious, comfort food.